Spangles has to be close to the simplest possible game - the pieces are just two colors of triangle, there is no board, and the goal is simply to construct a larger triangle. The rules: players alternate playing adjacent to the existing pattern. 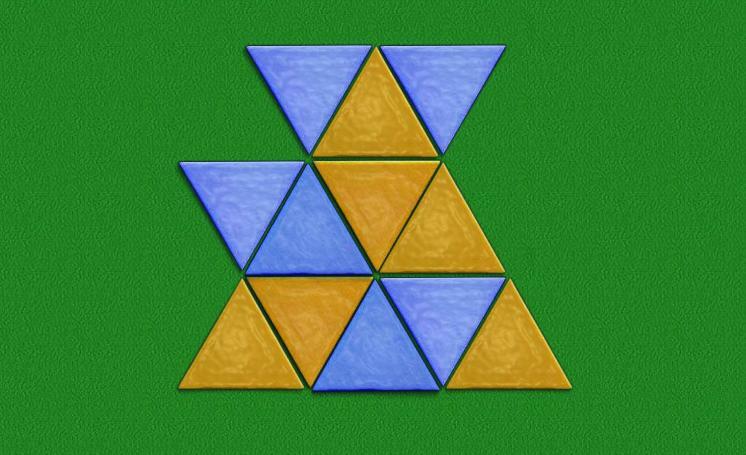 The first player to form a four tile triangle with his color on all three tips (and either color in the center) wins. Robots: to be determined, but the robot won't miss an early win. The back story: After Trax, friend-of-friend David Smith became just friend. He rediscovered spangles, one of his earlier inventions, and encouraged me to add it to the site. I was in a boardless tile-pattern game phase, so it made the cut (along with Che and Palago at about the same time).